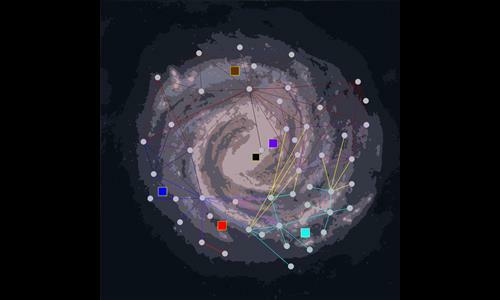 The Milky Way in the Mass Effect franchise. Mass Relays connect Star Clusters. Star Clusters consist of Star Systems. Star Systems consist of Planets, Asteroids and Moons. Planets consist of Orbital Stations and Continents. Review by Seleukos on 11/12/2017. I like this map's concept, but the execution doesn't seem to work well as a Warlight map. Some of the bonuses are huge, and impractical to obtain until you've reached the point where you've already won. Fortunate is the player who starts out in Serpent Nebula. Both Inner and Outer Council bonuses are theirs for the taking, and so is the game. The only other bonus that's somewhat reasonable to get is Earth Alliance Space, but even that is too big for my taste. Additionally, some of the connections (particularly the green ones) are hard to see, and that led to many a case where I lost control of a star because I hadn't noticed it connected to somewhere else in the heat of the battle. Finally, is there a point to the Galactic Core region? I'm sorry if that came across too critical, but those are the concerns I had while playing on this map. Other than that, the map looks technically sound, and is aesthetically pleasing. The problem is i based it on source material (clusters, bonuses and connections) so i think we can blame Bioware. It seems thou, they have thought this throu quite well considering Serpent Nebula is the location of the Citadel and therefore controlling it is the KEY in lore to control the Galaxy. I will change the colour of the green connections, thank you. Review by Daryle on 11/17/2017. Very interesting map. I like the fact that you have to reinforce your area to prevent an attack from all the way across the board. Good job.